The Genesee County Sheriff's department has arrested Robert Kenny, Thetford Township's police chief, for allegedly embezzling from the U.S. military surplus program, and obstructing the investigation. Thetford Township is a small agricultural community of about 7,000 people north of Flint. In 2012, Kenny acquired more than a million dollars' worth of military surplus, ranging from a bouncy house to a 7-ton forktruck. But the surplus immediately started to go missing, and Kenny refused to disclose to the township supervisor, Gary Stevens, and a township trustee, Stan Piechnik, what he'd done with it all. The two men tipped off the Genesee County Sheriff's office, which raided the township police department in April. The surplus program does allow law enforcement agencies to later sell items they acquire - but they have to keep tabs on it all, and the revenue from sales must go into the local department's budget - not the pockets of individual officers. Genesee County Sheriff Robert Pickell will release details on the allegations Thursday morning. Thetford Township is a sleepy-looking community of about 7,000 people, retirees and farmers, mostly. It was voted third safest in Michigan in a recent survey by the Michigan Township Association. Even so, it has its own police department, made up of one part-time officer, one full-time officer, and one police chief. But township trustee Stan Piechnik thinks the chief has spent more time acquiring military surplus than protecting the community. Here's some of the surplus - where's the rest? 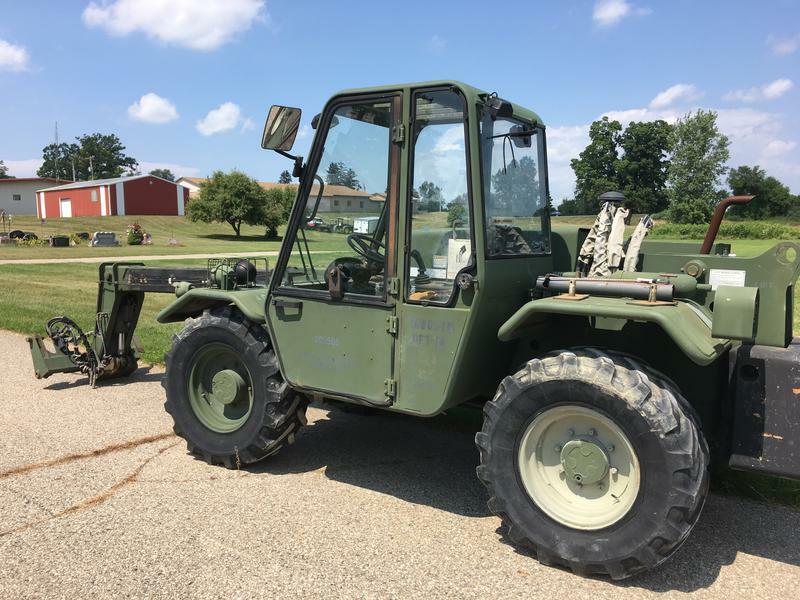 A small town official says his police department has acquired more than a million dollars worth of excess military equipment – but no one seems to know where it all is. Stan Piechnik is a trustee of Thetford Township, a community of about 7,000 people just north of Flint. He says he's not sure why the police would need it in the first place. "Statistically, we're the fourth safest municipality in the state," says Piechnik, "and that came from the Michigan Township Association." The 1033 program allows police departments in the United States to obtain surplus military equipment at no cost. 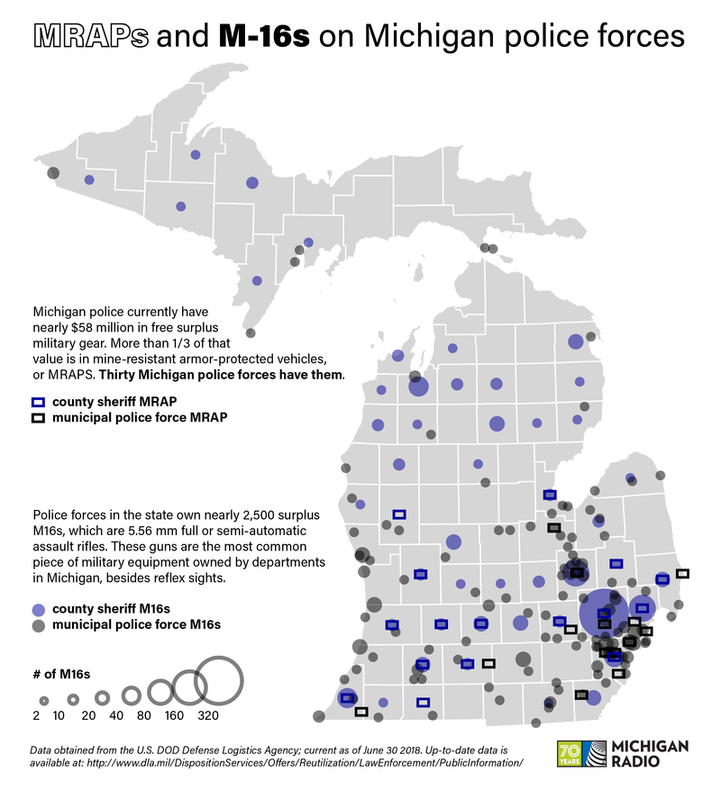 Seven months after an executive order from President Barack Obama called for the removal of militarized vehicles in cities across the country, 14 Michigan police agencies could receive new armored vehicles from the federal government. 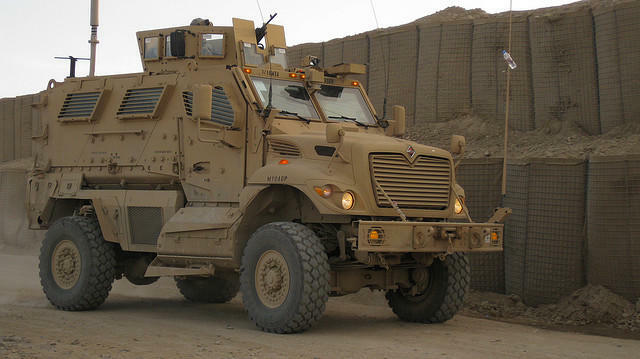 These agencies expressed interest in getting the Mine Resistant Ambush Protected (MRAP) vehicles as of Dec. 21, 2015 with the 1033 program, which is led by the Defense Logistics Agency in the Defense Department. The program provides support to the country’s law enforcement with military surplus supplies.